"I'm 28 years old, and the only thing I'm good at is being gay." Greg Berlanti's The Broken Hearts Club: A Romantic Comedy introduces us to a group of longtime friends, gay men in search of love and fulfillment in West Hollywood. Dennis (Timothy Olyphant) is a photographer looking for a long-term relationship; his housemate Cole (Dean Cain) is an aspiring actor with a penchant for breaking hearts. Kevin (Andrew Keegan) is a "newbie," a young man who hasn't come out yet; Jack (John Mahoney) is the aging owner of the "Jack of Broken Hearts Club," the restaurant where several of the characters work. Howie (Matt McGrath) is obsessed with a former lover, while Benji (Zach Braff) can't get enough of the "gym bunnies" at the local workout joint. And Patrick (Ben Weber), less attractive than the rest of the group, finds himself pressed to donate sperm so his sister and her lesbian girlfriend can have a genetically-appropriate baby. Actually, these plot details don't matter much to the film as a whole. Writer/director Berlanti sets out to present contemporary gay America in naturalistic terms, avoiding the stereotypes, drag queens, AIDS victims, and second-banana best friend roles typical of mainstream Hollywood movies. He succeeds, primarily because his characters are complex and human, with frailties, flaws and personality traits unrelated to sexual orientation. The ensemble cast seems perfectly in tune with the material, presenting a rich mixture of individuals, brought together by a common trait but held together by more lasting bonds. Of course, this is a comedy, and there are a lot of great one-liners and some solid comic moments. John Mahoney turns in a particularly funny scene as the least convincing drag queen imaginable, wearing a frowsy gray wig and an ill-fitting red dress, complete with crooked fake breasts and a visible t-shirt. Unlike some of its more strident cinematic peers, The Broken Hearts Club goes out of its way to be mainstream-friendly, with "gay glossary" intertitles and plenty of pop-culture references to Bette Midler, Karen Carpenter and other icons. Brothers Paul and Chris Weitz (American Pie, Chuck and Buck) pop up in bit parts, and the "in jokes" are deftly opened up to an audience that might not be familiar with the culture. There's very little to offend here—sexual references are far from explicit, limited to some passionate kissing onscreen, and issues of prejudice don't intrude on the story in any significant way. Ultimately, The Broken Hearts Club: A Romantic Comedy resembles The Boys in the Band cross-bred with Steel Magnolias; it doesn't have a lot to say, but it's gently funny and warm in unexpected ways. I can't say The Broken Hearts Club is a great movie; it's consistently entertaining in its slice-of-life way, but the intertwined stories don't flow together very well. There's no thematic unity or ultimate "point" to the film beyond general observations about the value of friendship, love and extended family. Still, it's fun while it lasts, and its honesty and accessibility should allow it to reach a wider audience than would otherwise be the case. Image Transfer Review: Columbia TriStar presents The Broken Hearts Club in its original widescreen 2.35:1 "scope" aspect ratio, with an anamorphic transfer, as well as a 1.33:1 pan & scan full-frame version (selectable from an "Aspect Ratio" menu). The widescreen transfer looks just great, drawn from a very clean source print with solid detail and color—the film has a slightly soft look with visible grain in a few darker shots, but the digital transfer is nicely done. The cropped full-frame transfer suffers from the usual pan-and-scan problems—characters talking offscreen, composition damage and a general visual awkwardness—though it's otherwise comparable to the widescreen edition. Audio Transfer Review: The Broken Hearts Club features three audio tracks—Dolby Digital 5.1 English, Dolby 2.0 Surround English, and Dolby 2.0 French. The 5.1 track features solid music and decent bass, with centered dialogue and a surprising degree of directionality where sound effects are concerned. The 2.0 track sounds like typical "downmixed" stereo surround, with fuzzier imaging, slightly muddier dialogue and weaker bass, but it still sounds pretty good. The French soundtrack benefits from decent dubbing with a good feel for the characterizations; it's otherwise similar to the English 2.0 mix. This isn't a "showcase" audio disc, of course, but the theatrical 5.1 mix is more impressive than I expected. 4 Other Trailer(s) featuring Groove, All About My Mother, Futuresport, Go! Director Greg Berlanti and producer Mickey Liddell contribute an enthusiastic, densely packed running commentary, covering "making-of" notes, discussion of intent, and humorous anecdotes at a pace that rarely pauses for breath. The trailer is a video presentation, in 1.33:1 full-frame ratio with Dolby 2.0 audio, running at 30 frames-per-second with 3:2 film-to-video pulldown apparent. I would have preferred to see a real theatrical trailer, but perhaps the movie was only promoted on video. A collection of trailers for "related" movies includes promos for Groove, All About My Mother, Futuresport, and Go!. All are non-anamorphic, and the Groove and Futuresport trailers are in 1.33:1 full-frame; most are limited to Dolby 2.0 audio, with the Go! trailer in full-blown Dolby Digital 5.1. A nice collection of seven brief deleted or trimmed scenes, with optional commentary by Berlanti and Liddell. The clips are taken from a video work-print, letterboxed to 2.35:1 with generally poor image resolution (particularly bad on the last scene). Some of these moments are quite entertaining, though clearly not necessary to the finished film. A surprisingly limited set of brief "bullet point" bios and selected filmographies, covering director Greg Berlanti and actors John Mahoney, Timothy Olyphant, and Dean Cain. 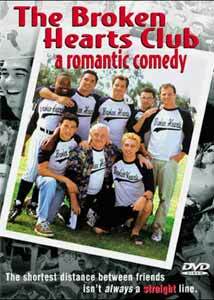 A simple PC-based DVD-ROM HTML link to the official The Broken Hearts Club website. The Broken Hearts Club is a warm, accessible slice-of-life comedy about a group of friends that steers clear of most of the "gay cinema" clichés. Columbia TriStar's DVD features a solid transfer and extensive supplements. Not a film for everyone, but well worth owning if the subject matter appeals.